Sony launches the next generation of powerful, versatile RX10 cameras, the RX10 IV. The new camera combines lightning-fast AF and 24 fps continuous shooting with a versatile 24-600mm f/2.4-f/4 zoom lens. 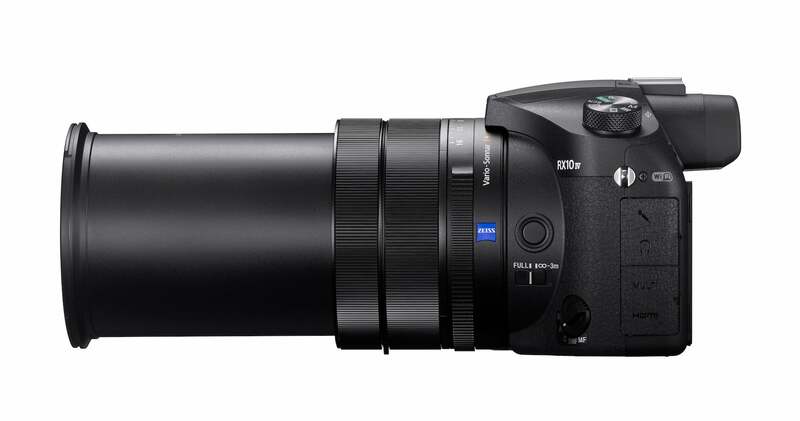 NEW YORK, Sept. 12, 2017 – Sony – a worldwide leader in digital imaging and the world’s largest image sensor manufacturer – has today announced the new flagship model in its acclaimed Cyber-shot® RX10 series, the RX10 IV (model DSC-RX10M4). Featuring the world’s fastest1 AF acquisition time of 0.03 seconds (5) and up to 24 fps continuous shooting (2) with full AF/AE tracking, 315 phase-detection AF points that rivals those the fastest professional interchangeable lens cameras and an exceptionally versatile 24-600mm (3) F2.4-F4 ZEISS® Vario-Sonnar T* lens, the new RX10 IV model delivers an unmatched combination of mobility and speed for imaging enthusiasts and professionals looking for the ultimate ‘all-in-one’ solution. 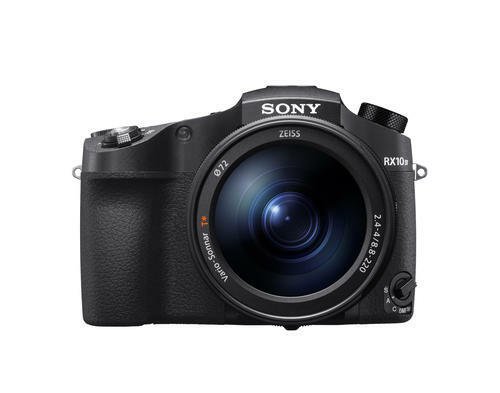 The impressive RX10 IV camera is equipped with a latest 1.0-type 20.1 MP (6) Exmor RS CMOS stacked image sensor with DRAM chip along with a powerful BIONZ X™ image processor and front-end LSI. These key components all work together to maximize overall speed of operation and performance, ultimately ensuring the highest possible image and video quality throughout the entire range of the 24-600mm (3) lens. A first for Sony’s RX10 series of cameras, the new RX10 IV model features a Fast Hybrid AF system that combines the respective advantages of 315 phase-detection AF points covering approximately 65% of the sensor and contrast-detection AF to ultimately enable the camera to lock focus in as little as 0.03 seconds (5). This high speed focusing complements the extensive 24-600mm (3) range of the lens, ensuring all subjects can be captured with precise detail and clarity. Other AF improvements in the new RX10 IV camera include an enhanced version of the popular Eye AF, Touch Focus and Focus Range Limiter (7). AF-ON setting is also assignable, as well as multiple AF modes including AF-S, AF-C and AF-A, which can be easily adjusted based on user preferences and shooting situations. 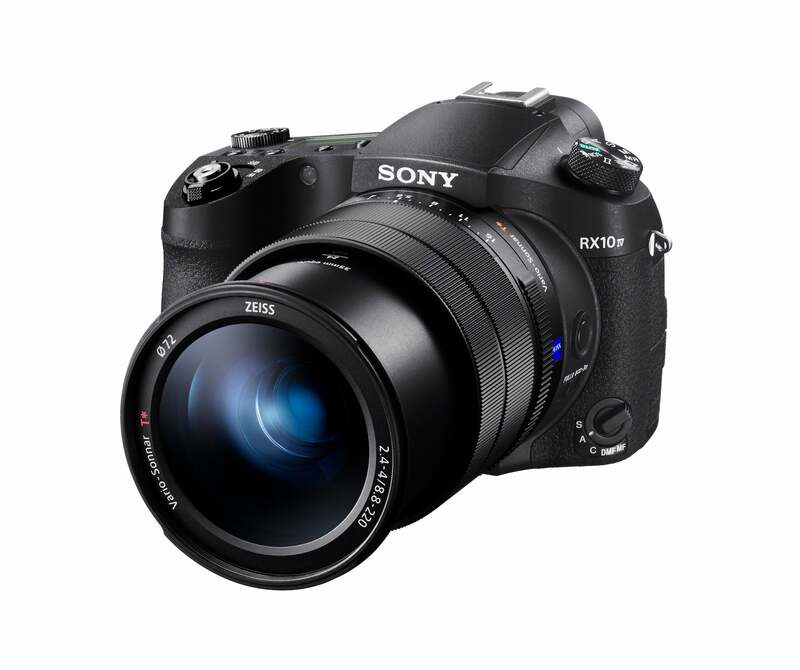 An ideal complement to the AF system, the RX10 IV offers continuous high-speed shooting at up to 24 fps (2) with full AF/AE tracking, with an impressive buffer limit of up to 249 images (8). With the significant improvements in processing power for the new camera, EVF display lag during continuous shooting has been substantially reduced, allowing shooters to capture the decisive moment with ultimate confidence. Also, for convenience during image playback, continuously shot images can be displayed in groups instead of individual shots. The 24-600mm (3) ZEISS® Vario-Sonnar T* lens on the Cyber-shot RX10 IV camera features a large maximum aperture of F2.4-F4.0, helping it achieve outstanding image quality throughout the entire zoom range, all the way up to ultra-telephoto. It includes a super ED (extra-low dispersion) glass element and ED aspherical lenses to minimize chromatic aberration, and ZEISS® T* Coating to minimize flare and ghosting. The lens also has built-in Optical SteadyShot™ image stabilization that helps to reduce camera shake and image blur. When the feature is activated, it is equivalent to an approximate 4.5 steps shutter speed improvement. The new RX10 IV model becomes the latest Cyber-shot RX camera to offer the advantages of 4K (QFHD 3840 x 2160) movie recording, with its Fast Hybrid AF system realizing about 2x faster focusing speed compared to the RX10 III. In 4K mode, the new RX10 IV utilizes full pixel readout without pixel binning, capturing approximately 1.7x more information than is required for 4K movie output to ensure that all the finest details are captured accurately. The camera utilizes the XAVC S™ (9) codec, recording video at a high data rate of up to 100 Mbps depending on shooting mode. Users have the option of shooting at either 24p or 30p in 4K mode (100 Mbps), or in frame rates of up to 120p in Full HD mode. The new camera also has a variety of other professional-caliber video features including Picture Profile, S-Log3/S-Gamut3, Gamma Display Assist, Proxy recording, Time Code / User Bit and more, as well as input for external microphone and output for headphone monitoring. Super slow motion (10) video recording is also available, with an extended duration of about 4 seconds (in quality priority mode) and 7 seconds (in shoot time priority). This unique feature gives users the ability to choose among 960fps, 480fps and 240 fps frame rates and among 60p, 30p and 24p playback formats (11). 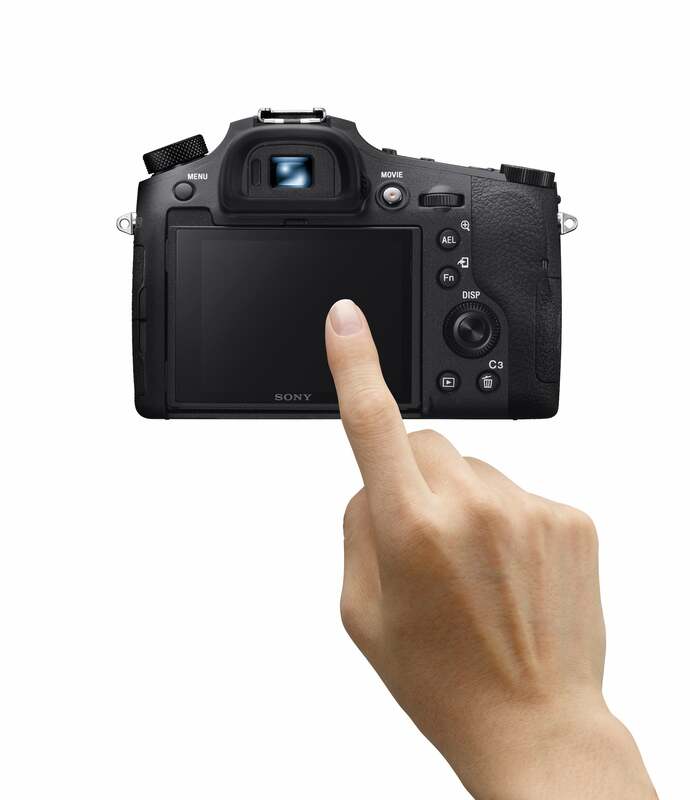 The new RX10 IV features Sony’s latest 3.0-type 1.44M dot tiltable LCD screen with Touch Focus and Touch Pad function – another first for Cyber-shot RX series – for quick and smooth focusing operation, and WhiteMagic™ technology, ensuring that LCD viewing is bright and clear in even the harshest outdoor lighting conditions. Additionally, it is equipped with an approx. 2.35M dot high-contrast XGA OLED Tru-Finder™, ensuring true-to-life image preview and playback functionality. Triple lens rings for aperture, zoom and focus are also available, with a completely quiet, smooth option for the aperture ring that is ideal for video shooters. To enhance customization, “My Menu” functionality has been added, allowing up to 30 frequently used menu items to be custom registered. Menus are color coded for easier recognition and navigation, and a new Movie Settings menu has been introduced to improve the overall video shooting experience. 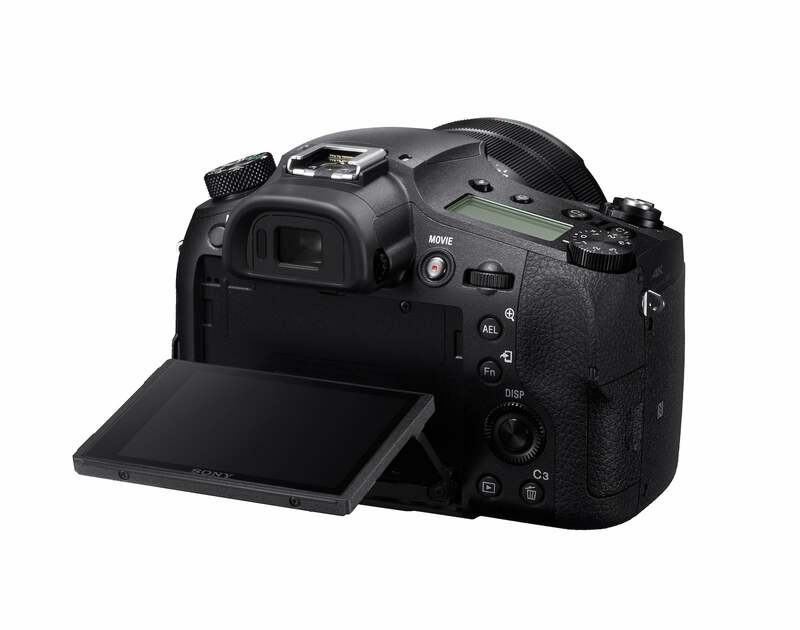 The RX10 IV is also dust and moisture resistant (12), and Wi-Fi®, NFC™ and Bluetooth® compatible. The new Sony Cyber-shot RX10 IV camera will ship in October for about $1,700 US and $2,200 CA. 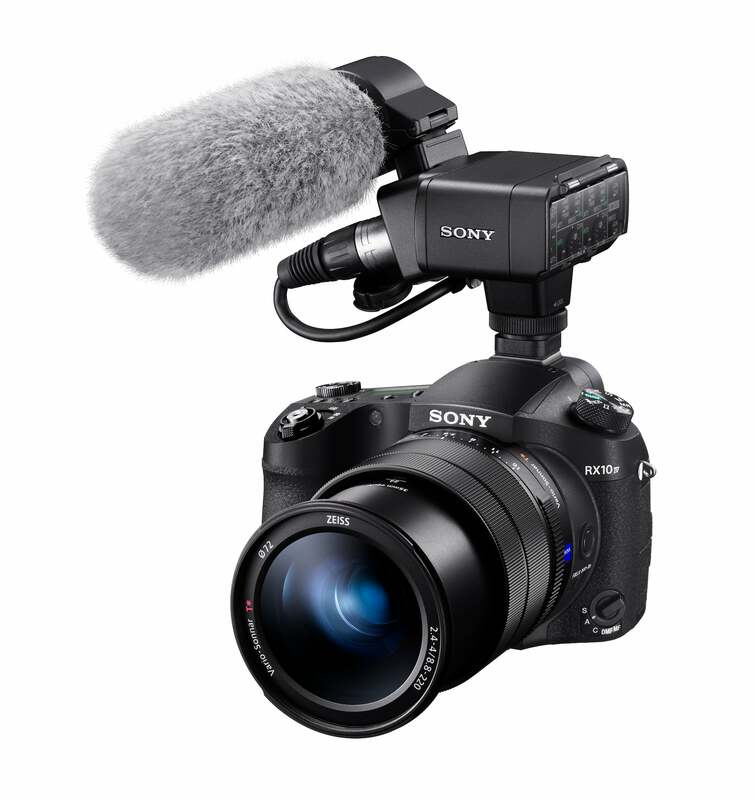 The new cameras and all compatible accessories will be sold at a variety of Sony authorized dealers throughout North America. More product information can be found HERE. A variety of exclusive stories and exciting new content shot with the new RX10 IV cameras and other high-end Sony imaging products can also be found at www.alphauniverse.com, Sony’s community site built to educate, inspire and showcase all fans and customers of Sony imaging products. A full gallery of images from the camera can also be found HERE. 1, Among fixed lens digital cameras with 1.0-type sensor. As of September 2017 press release, based on Sony research. 2, With "Continuous shooting mode: Hi". 9, A Class 10 or higher SDHC/SDXC memory card is required to record movies in the XAVC S format. UHS-I (U3) SDHC/SDXC card is required for 100Mbps. 10, Sound cannot be recorded. A class 10 or higher SDHC/SDXC memory card is required. 11, In NSTC mode. Switch between NTSC and PAL using the menu. 12, Not guaranteed to be 100% dust and moisture proof.